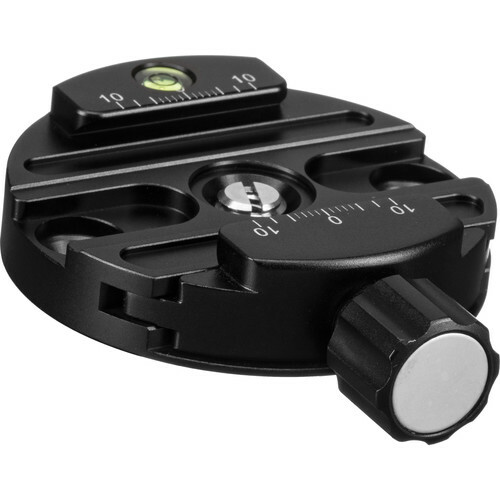 The Discal Clamp 64mm from Sunwayfoto is a Swiss-Arca-compatible integral screw-knob clamp with an anodized black finish. It has a captive knob, safety-stop grooves, and a hollowed-out design that reduces the weight of the clamp. You can use an M6 screw to mount it to an AS-style ball head, and it will accept any standard Arca-Swiss quick-release plate. This Discal Clamp also has an integrated bubble level. Box Dimensions (LxWxH) 5.1 x 4.5 x 1.2"
Discal Clamp 64mm is rated 4.9 out of 5 by 7. Rated 5 out of 5 by ron from Well made and a great value I am very impressed with the quality of this clamp from Sunwayfoto. Makes you wonder why some of the big name players charge what they do. The machining of this clamp is every bit as good as any clamp I've seen. I was a little concerned about the width of the jaws being too narrow but they hold my D610 with Nikon 300mm f/4 using a universal Sunwayfoto rail very securely. And it was nice that a 30mm M6 screw was included in the box. Perfect clamp for the Arca Swiss P0 Ballhead - seems made for it. Rated 5 out of 5 by Largemouth from Great for monopod I bought this for my Giottos MML 3290B monopod and it fits great. I wanted this so I could keep the plates on my camera and lenses when changing from tripod to mono without having to take the plates off. This is a great product, strong well built, and well packaged. I would buy another if ever needed. Rated 5 out of 5 by Doug from Perfect on monopod,,, Use on monopod so I can switch between lenses quick and easy. Looks to be well made and works exactly as it should. Works with all my arca-swiss comp. plates. Rated 5 out of 5 by Gary P. from Very impressed for the price I bought this in order to use my L-bracket equipped DSLR with a recently purchased (from B&H) monopod. It arrived nestled in a foam insert inside a nice box. Very nicely made and it is the perfect size for my Manfrotto monopod. The only thing I would change - add a rubberized cover on the locking knob for the clamp, which would increase the diameter and make it easier to to loosen and tighten. Rated 5 out of 5 by Marc from Excellent I purchased this initially for my Arca Swiss P0 ballhead because I preferred the short handle. But trying to reuse a M6 screw from a previous RRS clamp, it proved too long and interefered with the internal ball in the ballhead. Nothing wrong with the clamp, but for a P0 ballhead, stick to the DDY-60p0 Discal Clamp also from Sunwayfoto. The screw is supplied and of the right length. Rated 5 out of 5 by Mike from Top Quality - Exceeds Expectations Great clamp. Great value. Sits perfectly on my Gitzo monopod. What is a discal clamp? What is it use for? Asked by: Zon Hisham Z.
Discal is a proprietary name for this Sunwayfoto product. It is a contraction of disc and clamp . This looks like it would fit a Tiltall well. Is it the same size as the round top? Being that Tiltall tripods have a 1/4 thread on top, you can add the Sunwayfoto Stainless Steel 1/4 to 3/8 Tripod Adapter/Bushing (Set of 5) B&amp;H # SUTN1X5 to the Discal Clamp 64mm so they can fit together. The spec says the hole is threaded for ? . Does this come w/ a ?- bushing? I just received an Arca Swiss P0 ball head from B&amp;H. Will the Sunway Discal Clamp 64MM securely fit the 3/8 stud on the P0 head (using the M6 to 3/8 adaptor supplied with the P0)? The stud is pretty short - maybe 8mm long. I just want to confirm the clamp will grip the stud well enough that it will not rotate around the stud, especially in portrait mode.